Amelia is a member of SAG/AFTRA. Amelia grew up in Brooklyn and the suburbs of Chicago in a family of activist storytellers, so she's got a city edge with Midwestern grounded-ness, and a fair sense of right versus wrong. 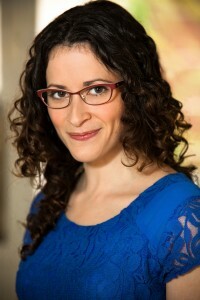 She studied improv at UCB and ComedySportz, acting at Lesly Kahn and Playhouse West, graduated from Northwestern University with a bachelor’s in Theater and a Pre-Med concentration (science is cool, all right? ), and got her MFA in TV and Screenwriting from Stephen's College. She studied voiceover with Nancy Wolfson, Billy Holmes and David Lawrence for commercial training. For animation, she’s studied with Bob Bergen and Susan Palyo. For dialects, she’s studied with Eliza Jane Schneider. Amelia writes about many things, but often she focuses on women struggling to define themselves within their absurd families, cultural Judaism and what that means in our modern world, and social injustices. Mostly, Amelia likes to talk. So if you have any questions, ask!